TSA Agent at LAX: "All I Could Think About Was Helping"
Even though he had been shot twice in the ankle and foot, all Tony Grigsby could think about was helping people. In fact, he was helping an elderly man flee gunfire during last week's rampage at Los Angeles International Airport when Grigsby himself came face to face with the gunman. "I was injured while helping an eldery man trying to get to a safe area," Grigsby said. 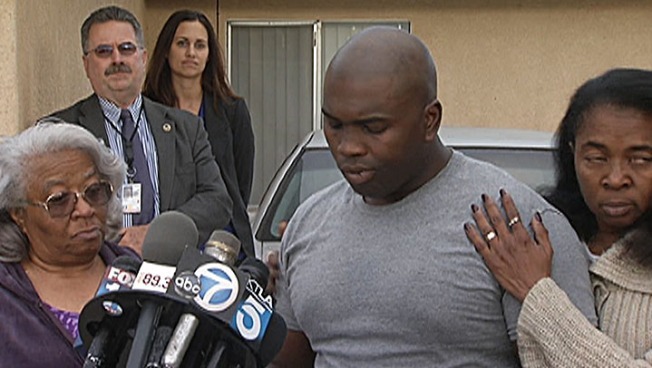 "I turned around, there was the gunman -- and he shot me twice." The 36-year-old TSA behavioral detection officer emerged from his grandmother's Los Angeles home on Monday for the first time since a 23-year-old suspected gunman allegedly used an assault rifle to shoot and kill one of Grigsby’s colleagues and wounded several other people. "After I heard the shot, I got to the area where the planes were at and people started coming toward us," Grigsby said. "All I could think about was helping them." He said he told himself, "I may be injured right now," but his concern was "to make sure people are safe first, then worry about me." Grigsby used a cane and was assisted by his grandmother Faye Maye -- whom he calls "Granny" and mother, and who also works for TSA -- on the walk from the door to the driveway where a clutch of media waited outside his home. He became emotional telling the story about his dear friend and TSA colleague Gerardo I. Hernandez, who was killed in the Nov. 1 rampage. Hernandez was the first such agent to die in the line of duty in the agency's 12-year history. "Only now has it hit me that I will never see him again," Grigsby said, fighting back tears. "He was a wonderful person and a friend, and I will miss him." The last time the two talked, they were joking about where to go in Mexico for vacation in two weeks. "I talked to him a lot," he said. "He's very, very dear to me."